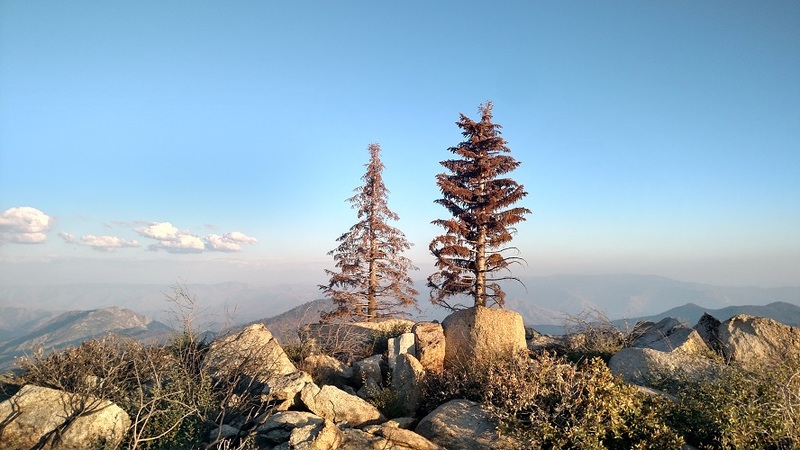 Location: Sequoia National Forest near Alta Sierra, northern Kern County. From Lake Isabella, take Highway 155 north for 6 miles to Wofford Heights. Turn left to stay on Highway 155 (Evans Rd.) and follow it for 7.7 miles to Greenhorn Summit. Turn right on Rancheria Road (note the sign for Sunday Peak as well as a few other destinations). Follow this dirt road (rough in a few spots but regular clearance vehicles shouldn’t have a problem) for 1.2 miles. Bear left and follow the road another 5.3 miles to the signed Sunday Peak trail head. Approximate coordinates are N 35.7946, W 118.5769. 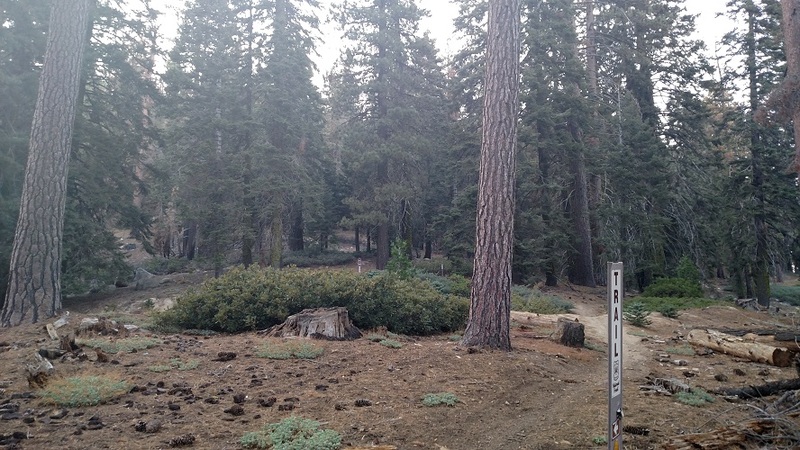 Note that these forest roads may be subject to closure due to weather. Call 559-539-2607 for road conditions beforehand. 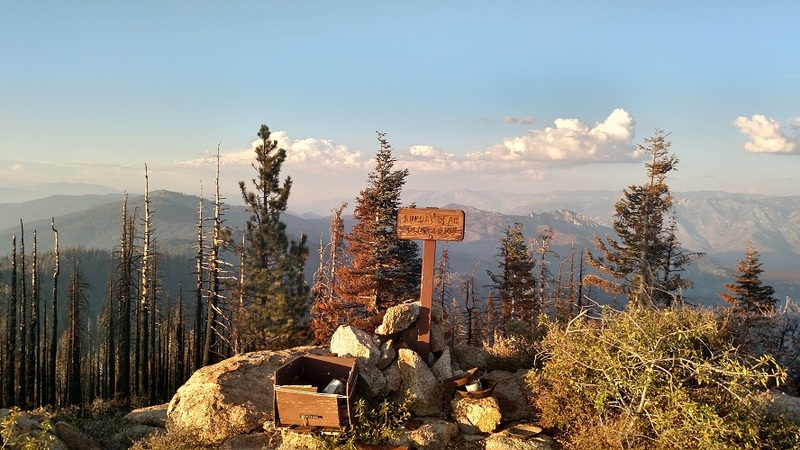 Sunday Peak is the seventh tallest named summit in Kern County and the highest point in the Greenhorn Mountains, a small range at the southwestern end of the Sierras. 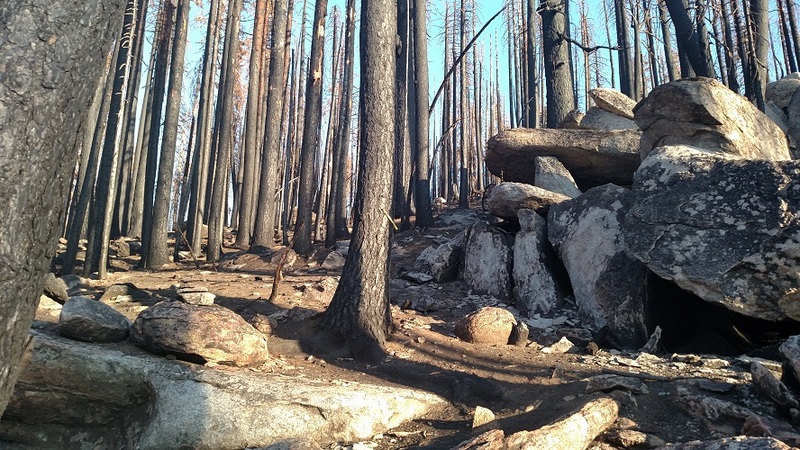 The peak was badly hit by the 2016 Cedar Fire and as of this writing the upper portion of the trail has been virtually obliterated. 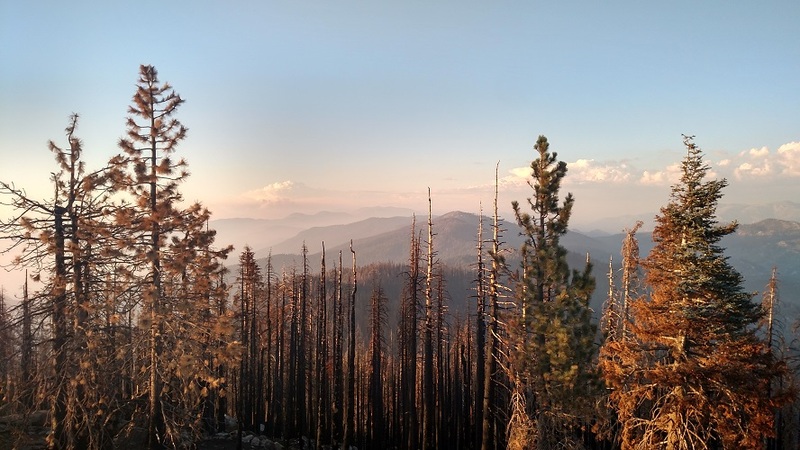 Fortunately it is still fairly easy to get to the 8,300-foot summit where your efforts are rewarded with a 360-degree panorama that rivals those of the best Los Angeles area peaks. From the dirt turnout, follow the single-track trail that parallels the road and veer to the left onto another trail. Look for a fallen sign indicating 1.5 miles to Sunday Peak. The trail ascends steeply at first before leveling out and following the eastern side of a ridge. At about 3/4 of a mile from the start, the trail crosses to the western side of the ridge. 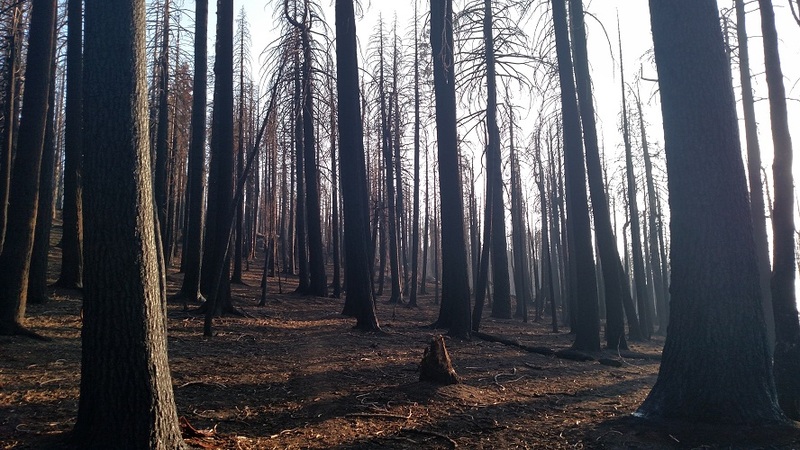 You enter a ghostly forest of burned pines which look particularly eerie late in the afternoon, when the sun causes them to cast long shadows. The trail becomes a little vague at this point but if you look carefully you can see it bending south (left). Sunday Peak itself is visible at this point between the trees. (Note that Google Maps incorrectly shows Sunday Peak as being a short distance west of its actual location). 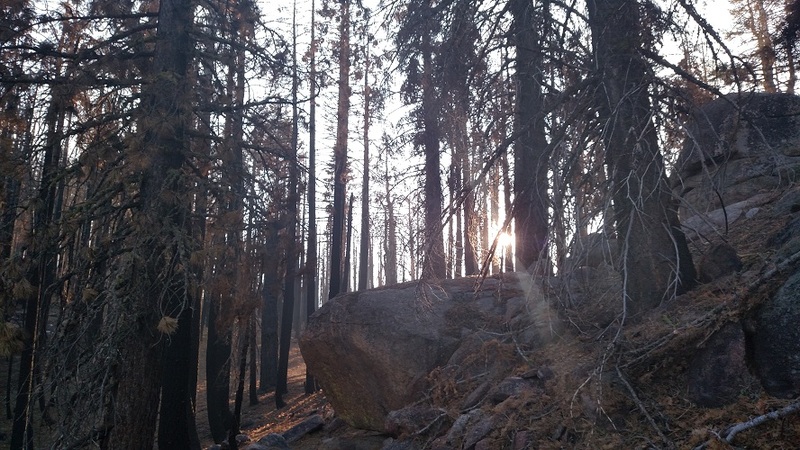 You ascend to a ridge where, about 1.3 miles from the start, you’ll take a hard left at an easy to miss junction by a large pile of granite boulders (look for a yellow ribbon tied to a tree and trail ducks). Follow the trail up to a saddle between Sunday Peak (on your left, now to the north) and Bohna Peak to the southwest. From this point, there is virtually no semblance of a trail, so head north toward the summit, choosing the path of least resistance. Other than a few boulders and some minor bushwhacking the terrain is actually pretty easy and depending on your exact route you will soon find yourself on Sunday Peak. 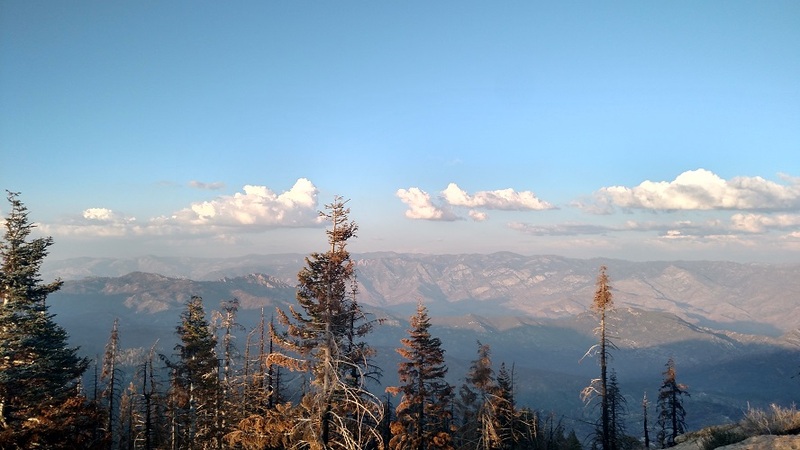 On the summit, the views include the lower Greenhorn peaks, the Kern River Valley, the San Joaquin Valley and the distant higher summits of the Sierras. After taking it all in, retrace your steps (to the extent possible) to the saddle and then back down to the trail head. As for the name, it is one of several peaks in the area named after days of the week (Saturday Peak, elevation 4,143, is located some distance to the southwest). It is also thought to be the day of the week when the summit was first surveyed. Looking forward to exploring the Sequoia National Forest Xena. We were supposed to go up there for camping this summer but the trip got cancelled. I will be sure to come back to your site to get some idea for the trails! Thank you! Yes, it’s a long drive but it’s worth the effort to get there. We did Sunday Peak and the Unal Trail in one long day, about 14 hours total time. Obviously camping in the area gives you more options, but it is doable even as a long day trip, at least for the next month or so before it gets cold as the days get short. Looking forward to seeing the pictures! Aww thank you! Hmm that sounds fun too! We have a camping trip and a road trip planned for next month so not sure if i can squeeze one in but I would love too! !